I am all about reviewing new gaming accessories, but this is a new one for livingdice.com, a review of a roll of paper. Gamingpaper.com sells rolls of 1-inch graph paper in 30″ x 12′ rolls for role-playing and miniature games. All gamers use graph paper at some point in their gaming careers, but the scale of this product caught my eye, so I requested a sample for a review. Gamingpaper.com kindly forwarded me two rolls. 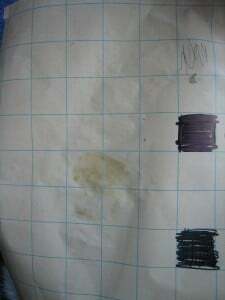 Graph paper is graph paper, and the squares are exactly one inch square, not much to review there.  However, Gamingpaper.com claims this paper is coated to make using pens on it easier and to prevent bleed-through on to your table. 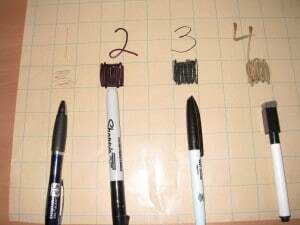 Never one to let a claim go untested, I performed some testing using a ball-point pen, a black “Sharpie,” a wet-erase pen and a dry erase pen. I then dragged a finger across the writing after about 30-seconds. I also colored in a square using these pens to test the paper’s ability to resist “bleed through” with large amount of ink. After 30-seconds, I also dragged my finger across the filled squares. Here is the image of that test. Note the total lack of smearing. I had expectations that the Sharpie or the wet-erase would smear, but it just did not happen. The surface is slightly shiny, so there is good contrast between the light-brown paper and the ink. Here is the underside of the paper. There was no bleed from the front, even from the blacked-out squares. I then moved on to a simple strength test to simulate players moving the paper around a game table. I grabbed opposite sides of the paper and pulled. Although quite thin, it is sturdier than it looks and did not tear readily. That said, it does tear easily when you start tearing from an edge. It is paper, after all. I nearly stopped at that point, but there was one final test using a substance that is on every game table. Here is the paper after a soda-soaking accident that was quickly mopped up, simulating the lightning-reflexes of caffeinated gamers. The paper stained and distorted in just a few seconds. It dried after a few minutes, but was still “wrinkly” after the Coke flood. This test is not really fair because Gamingpaper makes no claims about water-resistance, but I think gamers would like to know what happens if it gets wet. I really like this stuff. It took the standard pen and ink types with no issues, resisted tearing reasonably well and survived a Coke deluge in fair condition. It is also dirt cheap at $4.00 for 30 square feet. I envision one might use this product for large events when dry/wet erase battlemats are in short supply, or when you want to prepare something in advance that is permanent. One use that I am considering is wrapping paper for Christmas. It might be fun to draw a dungeon on it and then use it to wrap presents for a gamer. ← American Pirates–The Constitution Allows It! This is exactly the product I need for the Pathfinder AP #13. I had to draw that stupid Gambling hall over and over and over. This would have been nice to just draw it once and just pull it out each time I needed it. Product looks solid. Don’t know if i’d personly go with it though. I would need 3 rolls to match the same amount of surface area as a easel pad which would be the same price. And not to sure if being a roll is a selling point for me. Thanks for this review! I’ve used huge graph paper up to this point, but the price was simply becoming daunting. My big question is how did the fact that it’s a ROLL of paper affect the map’s ability to lay flat? Miniatures are light weight and can never be counted upon to hold paper flat. Does this map have a curve to it that’s hard to get rid of or does it lie flat? It lays fairly flat right off the roll. However, it is quite light, so some well placed paperweight might be a good idea. For comparison, an easel pad from Office Depot is $20 for 50 sheets that are 27″ x 30″. 5 square feet each times 50 is 250 square feet, so $20/250 = 8 cents per square foot. Gaming Grid paper at $4 for 30 square feet is 13.3 cents a square foot. But why not try the Gaming Grid first, for less total money, to see if you like gaming on paper? 30 square feet is about enough to map 3 Goodman Games Dungeon Crawl Classic modules. And with it being a roll, you won’t have to split up the map into two pages like you do with the easel. Sharpies don’t bleed through the easel pad either, btw.